Bernie Sanders at Liberty University: Bernie makes an unlikely Bible-themed pitch to Evangelicals. Bernie Sanders speaks during a campaign rally at the National Nurses United offices on August 10, 2015 in Oakland, California. Bernie Sanders on Monday took his unapologetically progressive message to a famously conservative venue: Liberty University, the Evangelical school founded by televangelist Jerry Falwell. 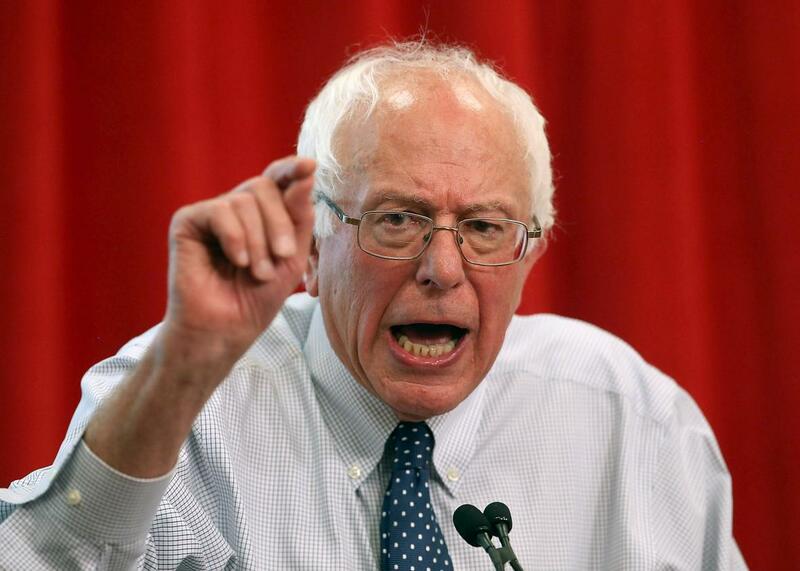 Once there, though, the self-styled democratic socialist delivered his trademark pitch through a frame that was familiar to the more than 10,000 evangelical students in the crowd—that of Christian-themed morality. Sanders’ visit to the university’s weekly convocation promised to be a stark departure from the usual scripted, play-to-your-base rhythm of traditional campaign events—and it did not disappoint. The morning began with Sanders, a 73-year-old non-observant Jew, standing awkwardly on stage as a Christian rock band belted out a song about Jesus, and ended with Sanders looking on as the students sat in silent prayer. In between, he read passages from the bible (Matthew 7:12, aka the Golden rule; and Amos 5:24, “But let justice roll down like waters…”), and quoted Pope Francis comparing capitalist greed to idolatry of the golden calf to make his political case to a crowd that was polite but clearly skeptical. “I want all of you, if you would, to put this in the context of the Bible, not me,” Sanders said. If Sanders economic justice message resonated with individuals in the crowd, it didn’t appear to do the same for the student body at large. During the question-and-answer session that followed his speech, the moderator challenged Sanders’ abortion stance, saying, “children in the womb need our protection”—a comment that drew by far the longest and loudest round of applause of the day and felt like a direct rebuke. The Democratic hopeful didn’t back down in the face of the thunderous ovation but, after briefly defending a woman’s right to choose, he quickly tried to pivot to the topic of child welfare in hopes of returning to his overarching theme that social welfare and Evangelical values overlap much more than the Republican Party would prefer to admit. It remains to be seen if that message will be one Sanders carries with him on the campaign trail moving forward, of if it was simply a one-off sales pitch to a crowd he’s unlikely to see again. If nothing else, though, it gave Sanders a prime opportunity to remind Democratic primary voters that he’s eager to seek common ground with conservatives—but unwilling to cede any.